Tropiflora bromeliads in all their glory! 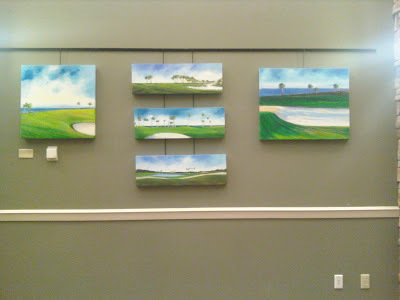 A couple months ago my fiance and I traveled to Naples picking up a payload of my mother's artwork from an art showing. I always plan out our "business trips" as vacations, making sure to get directions to local nature preserves, botanical gardens, cozy towns and nurseries in advance and this last trip was certainly no exception. 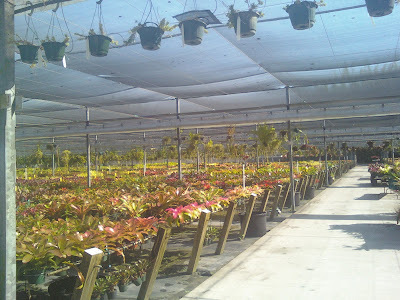 We managed to book two well landscaped hotels at very reasonable prices, attended the Naples Lawn and Garden Show, Tropiflora (pictured above with acres of bromeliads! ), and finished it off with swedish meatballs after a day of shopping at Ikea! First off, here's a shot from some of the gardens at the Sarasea Circle complex of hotels. Our room was a freestanding cottage style bit with our own porch and kitchen for $60 when we got it in the off season. This garden proves that even a pedestrian variety of plant choices can really shine if used in a great design. 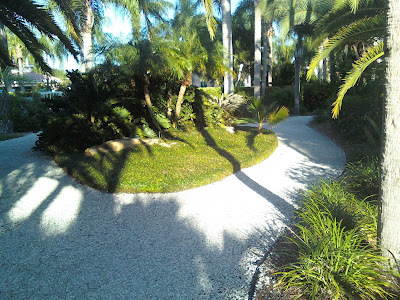 Minimal and yet naturalistic, the winding paths incorporate hardy liriope and asiatic jasmine as groundcovers, and an assortment of palm trees that are always so popular with the tourists that converge on this island in winter. Who am I kidding? I love palms too and they had a lot of Royal palms, whose trunks matched the limestone path precisely. The path is crushed limestone or shells which are in keeping with the native materials, but yet look stunning against the dark green groundcovers. If your garden is likely to be used at night be sure to make the paths white so they naturally reflect the moonlight, eliminating the need for lights. This is especially useful near the beach so that sea turtle hatchlings can follow the moon out to sea. The beach just to the south is prime nesting habitat for sea turtles, who prefer the fluffy and shelly sand for egg laying. The Naples Lawn and Garden Show had a great variety of plants, ranging from fruit trees to palms, bromeliads to natives. The cold hardiness information I got from growers was very valuable and surpising as well! Three growers I talked to experienced temps in the low 20's last winter on their properties just inland from Naples, even though coastal Naples barely freezed! Just one year of these temperatures would be a fluke, but I was told that the cold air actually channels down a strip of Southwest Florida making it colder than the surrounding area annually, which is especially interesting to me since there is an assortment of native orchids and bromeliads that grow there as well. If anybody in the area is aware of this anomaly, please let me know! I was actually going to take a trip to Tropiflora with the Seminole Bromeliad Society, but somehow it didn't work out. When we were able to stop by on our own however, it was like Disneyworld for me, since I'm an obsessive collector of bromeliads. There were definitely millions of bromeliads, succulents, ferns and orchids, countless species and varieties and somehow the place was still open to the public. You could literally get lost there just as we did, but rest assured that an employee will set you in the right direction again when you end up in a non public area. I felt like a kid in a candy factory who walked into a room of oompa loompas working on the perfect bromeliad, but luckily did not turn into a blueberry or have anything else creepy and Wonka-esque happen to me. When I found that a huge flowering clump of cold hardy Aechmea Kertesziae was too expensive for me at the time, I asked for a Vriesea Phillipo-Coburgii which they soon produced for me at a price of about ten dollars. I walked away with only that one bromeliad and a fern, but just taking in the view of expansive patchwork quilts of colorful (and well labeled) bromeliads was all I could ever ask for. Very informative post. Using those plants we sometimes consider boring in the proper arrangement makes us appreciate their beauty afresh. Good thought. And Tropiflora! Well, I really enjoyed hearing about that trip. Your mom sounds like a very special and talented lady. I would like to see more of her artwork. That sounds like a great trip. I loved the first photo at the hotel. Sounds like a neat place to stay. I've got to get to Tropiflora...I've heard it's a great place to go. Your mom's paintings are nice, too. Does she have a website? That Tropiflora place looks to tempting I would have to leave my wallet at home before going there. Tropiflora....WOW!! I'd love to go there! I'm impressed with your discipline! And your mom is GREAT!!!! Wonderful post!